Salmorejo, a rustic mixture of tomatoes, garlic, olive oil and bread, will make you wonder why you haven’t been eating chilled soups (at least this one) all your life. Cold soups. You mention them in West Texas and you just might get the stink-eye that says, “You must be some kind of commie.” Soup is warm weather food. Savory broths. Hot liquids. Sunshine in a bowl that is meant to warm heart, hands and body. We need to get over ourselves. We iced tea. Now we won’t drink it any other way. And I’ve seen West Texans galore sneaking iced/chilled coffee for their caffeine fix. (Nobody tells them they are all hat and no cattle just because they sneak off to Starbucks – at least not to their faces). It’s a rustic chilled soup that is a staple in southern Spain, hailing from Cordoba. Rich, creamy (no dairy though) and delectable. I got hooked eating it almost every day from a lunch counter in Sevilla during the summer and convinced some of my language teachers who said they made it on an almost-daily basis to show me how to prepare it. I don’t say cook because all you really need are the ingredients and a blender for the soup itself. There are four, must have ingredients – tomatoes, olive oil, garlic, vinegar and bread. Here’s a starting point for one of the quickest, most delicious anytime lunches or light dinners you can make. 3 pounds ripe tomatoes (chopped roughly. I don’t core, seed, half or anything else because I have a good blender that is going to make everything really creamy and what rustic dish requires that much refinement? I do cut off the tops.). 2 oz. of stale bread crust removed (I do prefer using an old artisan loaf, french bread or bolillo – five for $1 like you get at HEB – and not some sliced sandwich loaf). Put the bread in a glass of water and let it soak. 2 medium smashed garlic cloves (You could start with one large and work your way all the way up to as many as three. Garlic is the hardest ingredient to judge in this recipe. Baby steps until you get it right. What you don’t want is a really sharp garlic burn or a garlic taste that overwhelms everything else). Put the tomatoes and smashed garlic in the blender. Puree. Slowly drizzle the olive oil into the soup while it is blending. Keep going until it is well-emulsified/creamy and, perhaps, a bit frothy on top. Add salt to taste and adjust vinegar for the amount of tang you like. I like Salmorejo cool but not ice cold. Think about this before service and judge when you need to remove it from the refrigerator. 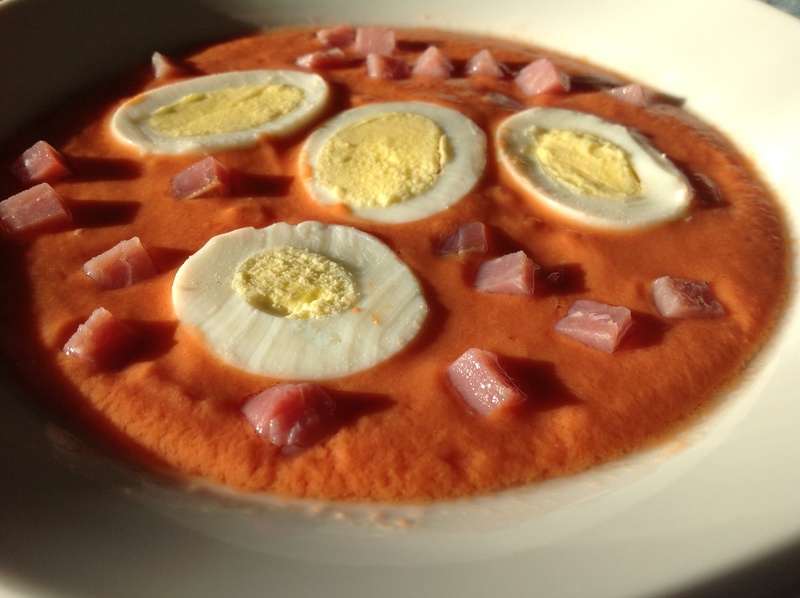 Traditionally, Salmorejo is topped with hard-boiled egg (chopped, sliced, grated) and serrano ham (I like it cubed). Serrano ham is impossible to find in these parts. I have the deli counter cut me a quarter inch slice of prosciutto and then I cube that when I get home. Regular cubed ham could give you that salt and textural change if you had to go that route, but I’d probably opt for crumbled bacon before I did that. Everything is better with bacon. To me, salmorejo is about like a pesto in that it’s only your own fault if you don’t get the flavor you like. Like a gun with fixed sites, you walk it into the target. Translation for those who don’t shoot guns: Tweak it. More tanginess=More vinegar. More garlic=more garlic. More creaminess=more soaked bread and olive oil. I’m fortunate enough to have a Vitamix, and I sometimes skip the bread altogether. It’s unlikely that you will go too far in one direction to save the dish, but it’s not like we’re dealing with high-dollar, high-falutin’ ingredients here like foie gras. Try it. If you have half a lick of sense about you (and you don’t hate tomatoes), you are going to like it. Maybe next time we can talk about Salmorejo’s Andalusian cousin, Gazpacho – not to be confused with the Gestapo, although that’s probably the only way you could have forced my grandfather to eat it. In the meantime, tell me how you liked it, the adjustments you made and any dishes you would like to learn in the future. I’ll be your test kitchen guinea pig and relay everything I learn via this blog. This entry was posted in Culinary and tagged egg, food, ham, olive oil, Salmorejo, soup, tomato on October 24, 2014 by Out of Abilene.